Scotty just wants to go home the Tuesday morning school is canceled due to the snow piling up outside. But his friends Jason and Pete convince him to stay a little longer to work in the shop, just until four o'clock when Jason's dad will pick them up. But the school slowly empties and the storm gets worse, and as the hours stretch into the evening, it becomes clear that no one is coming. Sevens teens are stuck in the high school in the worst blizzard in a century, and no one knows that they're there. At first, it's not too bad--they have access to plenty of food and they can wait it out. But then the power and the heat go out, and the snow continues to pile higher and higher, compromising the building . The snow has them trapped inside, but even the building isn’t safe anymore—will it be too late for Scotty and his friends? 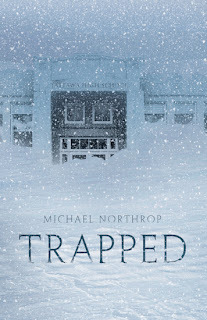 Trapped is one of those gripping and chilling reads that will make you question just how likely you would be able to survive if thrust into the same situation. It's quite a spectacular story of survival, but it's very well-described, showing that Northrop really thought this situation through inside and out. His writing also shows that he really understands teens; the attitudes, the feelings, and the interactions are all done very well, and the emotions and tensions that everyone feels due to their entrapment and despair are all very realistic. Northrop also makes really good use of foreshadowing as Scotty alludes to some fatal consequences of the storm at the beginning of the story, making the book seem a bit foreboding before the snow even really begins to fall. The ending was powerful and abrupt, but it does leave you wondering about the fate of so many people, most of which aren’t revealed, or are left up to the reader’s imagination. This is a quick, unsettling read that will be easy to get into, but not so easy to leave once you’ve finished. Cover Comments: How very appropriate this cover is! I love how the title letters are place in the snow and are sort of covered. The height of the snow and the dark colors really play into the dark mood and atmosphere of the book! Nice review. I love survival books for exactly the reason you said (how would I manage in the situation). I've heard mixed reviews on this one, but I'm still looking forward to it. How did you find the language? I read one review where the reviewer mentioned an over-use of "likes" and other "teen speak" as well as vulgar slang. Great review! I just picked this book for my Waiting on Wednesday and I can't wait to read it. Haven't heard of this book before, but I really want to read it now! I too love survival books, and just purchased Trapped while passing through a snowrich part of the Sierra. Looking forward to an interesting read! Thanks for the review. I'm excited for this book. Thanks for the awesome review!